Depending on the time of day, you may prefer something lighter but still filling. 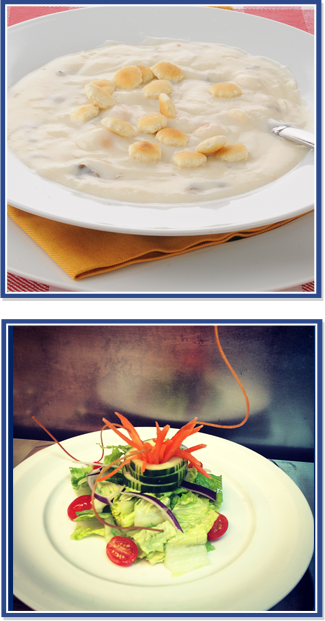 Try our soup of the day or the Cape Fear Seasonal Seafood Salad. A specialty soup that changes seasonally (just ask your server). A long time house special. Piping hot favorite, created with Cape Fear handpicked crabmeat. Fresh greens topped with tomatoes, cucumbers, carrots, onions, and croutons. Served with your choice of dressing. This salad can be topped with chicken, shrimp 8, or oysters 9. Fresh romaine lettuce tossed with generous amounts of Parmesan cheese, garlic-baked croutons, and our house Caesar dressing. This salad can be topped with chicken 7, shrimp 8, or oysters 9. A classic medley of artichoke hearts, red bell pepper, hearts of palm, kalamata olives, capers, and feta cheese tossed in our house Greek Vinaigrette with garden fresh basil, mint, and light hints of citrus. Served on a bed of romaine. Enjoy a dinner salad featuring fresh seafood and fresh local ingredients. This salad changes with the seasons. Just ask your server! Top any of our large salads with an 8-ounce portion of our daily fresh fish. Grilled chicken breast served on a dinner-size portion of mixed greens topped with tomatoes, cucumbers, onions, craisins, toasted almonds, and Parmesan cheese. Served with your choice of dressing.